BACHDENKEL was an English rock band that started under the name "YOU KNOW WHO" in 1968. The three piece consisted of bandleader Colin Swinburne on vocals/guitars/keyboards, Peter kimberley on bass/piano/vocals and Brian Smith on drums, with Karel Beer as additional musician, lightening engineer and producer. The band moved to France to live, perform and record. 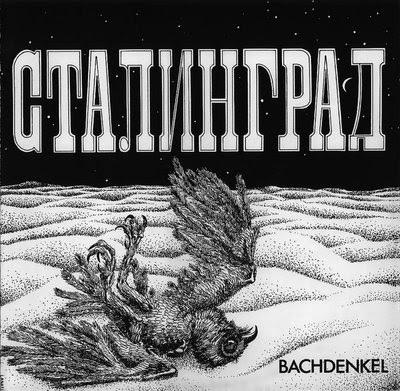 In the 10 years of excistence BACHDENKEL only recorded 2 albums, the first album "Lemmings" was recorded in 1970, but wasn't released until 1973, the second album called "Stalingrad" (in cyrillic letters) was recorded and released in 1977. in the mean time BACHDENKEL toured small venues through europe (mostly France). BACHDENKEL started as a Flower Power psychedelic rock band (Pink Floyd, Soft Machine, Beatles, Procol Harum), but developed towards a more symphonic/melodic progstyle for their second album. Their sound is dominated by guitar and drums, with great vocals and occasional keyboard passages. The band wasn't (and isn't) well known, but that doesn't lesson the experience and thrill you get when listening to their music. The 90's revival of prog resulted in some aknowledgement to their music, and Bachdenkel re-released their two albums on CD, with additional, mostly unreleased, material. Those CD's are very much recommended, also because the additional songs are practically as good as their previously released 'forgotten' masterpieces. A fabulous band that deserves universal recognition.